Melissa is a paralegal with the firm’s Litigation Department. 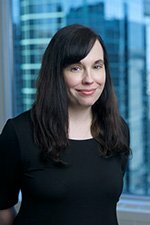 Melissa has extensive knowledge of the Canadian Court system, including the Supreme Court of Canada, Federal Court, Federal Court of Appeal, Ontario Superior Court of Justice and Court of Appeal for Ontario. She has experience in the preparation of pleadings and other documents for court, as well as all types of legal correspondence, and is responsible for keeping up to date on changes to legal precedents, rules and procedures.